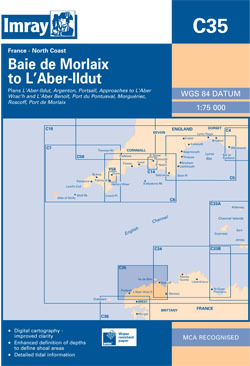 North-west coast of Brittany from the Baie de Morlaix to L'Aberildut. Scale: 1 : 76,600. Oner-minute gridlines. Larger scale plans of Ile de Batz, Approaches to L'Aberbrac'h and L'Aberbenoit, Argenton, Pontsuval, Mogueriec, Port Sall, L'Aberildut. Tidal stream diagrams.